HomeIdeas Men's Woolen Fabric Memory Foam Anti-Slip House Slippers- Black/Large- US 11-12/ UK 10-11 | What Should I Say? 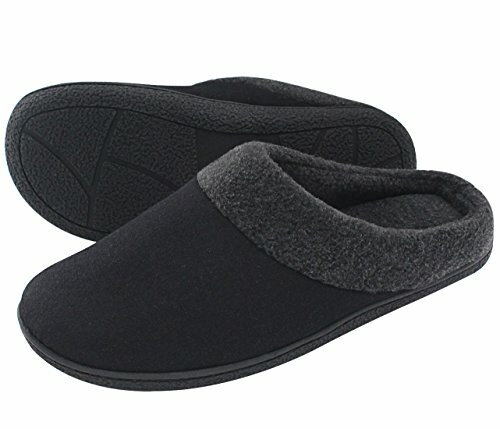 HomeIdeas Men's Woolen Fabric Anti-slip House Slippers - The ideal, must-have slippers for you! Would you feel better if you possessed a pair of house slippers which can take good care of your feet? Then these slippers are tailor made for you. Our high quality slippers are greatly enjoyed by all men, are suitable for wearing in the bedroom, hotel room, on the airplane or train. This would also be a great gift for your families and friends. ★Do not use hot water above 30 degrees to wash it, it might cry. Recommended: do not wash together with other clothing. ★If you are not sure about your shoe size, measure your feet from heel to toe in inches. Please find the below measurements for your reference. Treat your feet to a pair of HomeIdeas slippers today! - RISK FREE - Click 'Add to Cart' above to get yours now! SIMPLE, FASHIONABLE, ELEGANT: These slippers made of woolen fabric are soft and comfortable, make sure your feet stay dry and odorless. It also offers a high degree of ventilation, is light, anti-static and anti-slip. CATLIKE, NOISELESS STEPS: Environmental friendly and waterproof TPR sole offers you anti-slip protection due to the wave-like patterns on the bottom of the sole. The sole material is not easy to deform and odorless. It won't leave any scratch marks on any floor surfaces including wood and tile. The sole also comes with excellent noise reducing qualities, making it impossible for you to disturb your family while they're sleeping. MULTIPLE OPTIONS & EASY MAINTENANCE: ★Style: Easy to Slip on. ★Available in sizes Small, Medium, Large and X-Large. ★Available in your choice of Camel, Gray and Black. These stylish slippers fit most standard men's foot sizes. They are both hand and machine washable. CUSTOMERS ARE OUR PRIORITY: With HomeIdeas, you're taking no risk with your purchase. We offer 100% no risk money-back guarantee if you're not thrilled with your purchase for any reasons. Just tell us and we will do our best to give you the most satisfactory solution. Please check our HomeIdeas storefront for more slippers and other deals that are awaiting you!